Congressional decision-making is driven by politics, policy and process. This engaging 3-day Briefing and seminar on legislative operations provides the full Capitol Hill experience as our Washington-based experts focus on these 3 P's. They discuss the policy-making process and the legislative agenda, help you understand the congressional budget process, and demystify the culture of the U.S. Congress. The Congressional Operations Briefing - Capitol Hill Workshop and any combination of its topics can be tailored for custom on-site training for your organization. We have tailored this Briefing for attorneys, program analysts, budget analysts, military officers, scientists, SES, engineers, policy staff, and others. We have a special defense focused custom briefing available. For more information about how this seminar in legislative operations can help your staff, please contact our Vice President of Training.
" 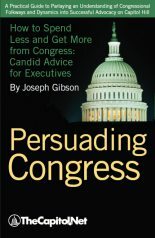 This hands-on practitioner's guide cuts away veils of mystery to shed light on the rules governing Washington's most impenetrable institution, the United States Congress." 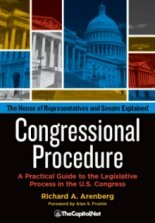 "[T]he ultimate guide and master blueprint to the legislative process." Two separate lunch presentations are included: 1) a historical perspective of the overthrow of House Speaker Joseph Cannon in 1910 and how that shaped the current role of the House Speaker; and 2) a discussion of Congressional hearings and testimony--the dynamics of the hearing process and what makes for effective testimony. These lunch presentations may vary depending on current events and scheduling. This workshop is also available as a custom program. A sample Defense/Security focus agenda is available as a pdf. A sample Homeland Security focus agenda is available as a pdf. Suggested Prerequisites The Congressional Operations Briefing - Capitol Hill Workshop gives a broad overview of how Capitol Hill works and how policy is made. All will gain valuable insight and perspective, regardless of Hill experience. Previous attendees include executives, managers, agency staff, technical staff, military officers, government relations professionals, lawyers, teachers, elected officials, program analysts, budget analysts, and others who needed a solid overview of Congress and the Hill. For a map with a list of hotels near the Capitol, click here. Our courses are held at these Washington, DC, locations. Other dates: Location in Washington, DC, will be announced before Briefing. For a map with a list of hotels near the Capitol, click here. Our courses are held at these Washington, DC, locations. This Briefing is approved for 1.7 CEUs from George Mason University. FAQs FAQs about our training including suggested attire. Available as custom, on-site training? Yes. This program is frequently tailored for on-site agency and military training. Please call 202-678-1600 for information. This Briefing can be tailored as a 3-day, 4-day, or 5-day Congressional Operations Briefing - Capitol Hill Workshop completely covering all congressional operations. See more testimonials about the Congressional Operations Briefing - Capitol Hill Workshop.